The word PESCO stands for Peshawar Electric Supply Company located in the Khyber Pakhtunkhwa province. PESCO provide the efficient and sublime service in Peshawar. Now PESCO offers you an amazing service, you can check your bill online from your computer. 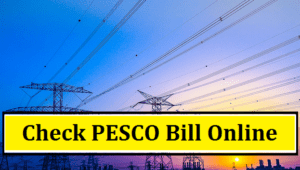 You can download and print a duplicate copy of your PESCO online bill from the given button. I hope this will helpful for you, if you have any question or any issue you can drop a comment below. We will reply your comment as soon as possible. Share this useful info. on the social media as well as with your friends. Stay in touch with us for more informative content on daily basis.